The traffic cop who decided to make four boys without helmets do roadside exercises rather than pay fines has spoken of his reasons for his actions. In an interview with Thai Rath Naret Srikhun defended his unusual punishment saying he felt sorry for the lads because they wouldn't have any money for sweeties. And he didn't want to cause hardship to their folks who were likely to be farmers. 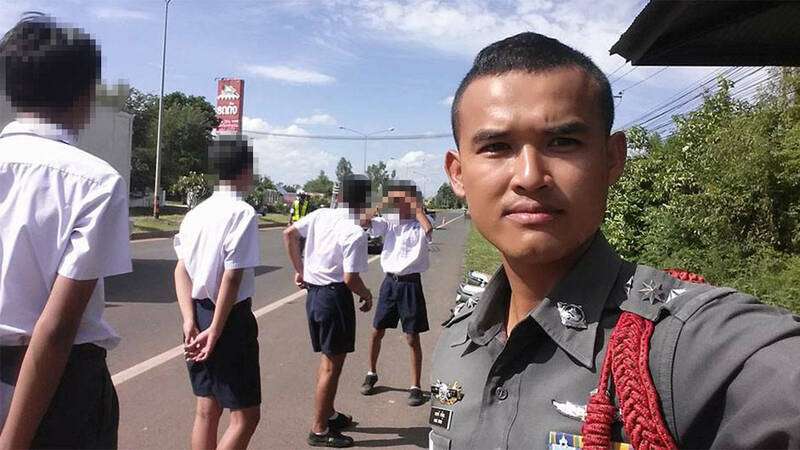 His actions in Mahasarakham came just a day before authorities in Ubon, also in Thailand's north east, were desperately trying to persuade youths not to ride motorcycles at all due to the carnage on the roads. There were reports that deaths among children under 15 on motorcycles going to and from school were up 28%. The governor of the province had had fake blood smeared outside a school to try to stop parents who let their kids ride to school on motorbikes. But in Mahasarakham Thai Rath called the officer's actions "cute punishment". Deputy sergeant Naret was unrepentant: "It seemed the right thing to do," he said. "If I fined them it will cause hardship to their mums and dads. And besides they would not have any money for sweeties. "It's not like in the cities here. We are country folk and most of the people are farmers". "Lots of people added me or requested to be friends on Facebook. I honestly haven't had time to add everyone yet", he said. "I have only got an old phone and it is about to give out because it's been ringing so much. Everyone wants to admire me and congratulate my policing skills". In latest figures released almost 350 young students died on motorcycles in just nine provinces in one year. The mentality of this make the mind spin!!!! It will cause even more hardship when the have an accident and finish up with brain damage OR DEAD. I can think of a few driving offenders (for offences far worse than no helmet), where it certainly would not cause hardship to their parents, who also got off scot free ! It doesn't say, but they were probably riding 4 up and were too young for a license as well. I thought the job of the police is to enforce the law, not make them up. My understanding of Thai law is that if under the age of 14 one cannot be charged with breaking the law. this is totally the wrong message to the kids - other kids - adults - parents - schools in fact just about everyone in the country that road safety - the law - the police - doesn't matter just carry on doing whatever the hell you like. And how much hardship will it cause the families when Junior wipes himself out and is lying dead on the road unnecessarily. Not a lot, Junior will be reincarnated as a buffalo and mom and dad will profit when they sell it.